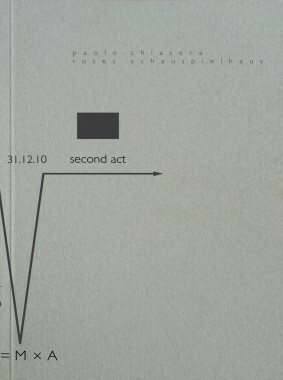 Rotes Schauspielhaus by Paolo Chiasera is really a transitory piece, and this book documents the various sequences and connects their contents. Chiasera begins with a public sculpture for Rosa-Luxemburg-Platz in Berlin-Mitte, that refers to the work of the architect Hans Poelzig, whose residential apartment blocks surround the square, and reconstructed the grandiose light columns from the demolished Großes Schauspielhaus in wood, cardboard and Styrofoam. This lied for three months among the trees on a small green plot and amidst the residential housing estate like a part of a temple ruin. In the course its existence, it decayed rapidly due to the influence of wind, weather and mere vandalism. From the remains, which he concentrated further with turpentine, he realised a relatively small picture, an iron-oxide version of a photograph of a bright, slightly cloudy sky. Chiasera, whose cosmos is strongly influenced by the thought of Aby Warburg, uses associative chains to stagger and concentrate meaning. 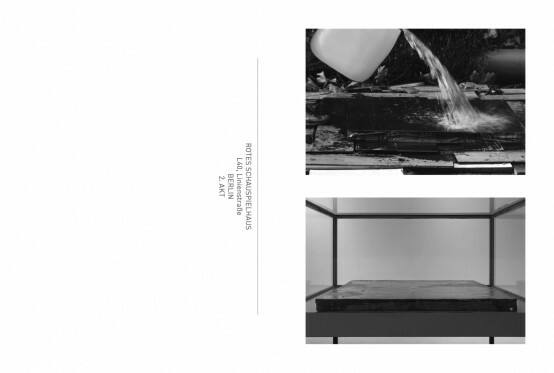 His works are basically historical experiments and at the same time models and images of these experiments. 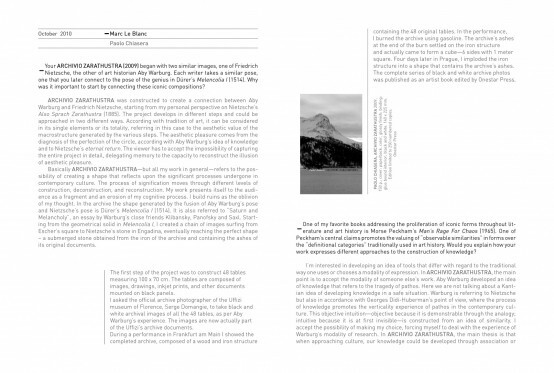 Edited by Susanne Prinz, with an interview by Marc Le Blanc.